Working undercover for the U.S. government in Rio, the daughter of a convicted Nazi traitor marries a ruthless Nazi spy, but then begins a love affair with her American contact. Torn between passion and patriotism, they must sacrifice their feelings or risk destruction. 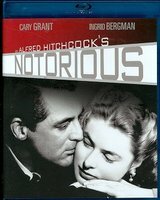 RKO Radio Pictures, Inc. ; a Selznick release ; screenplay by Ben Hecht ; [produced and] directed by Alfred Hitchcock. Beverly Hills, CA : MGM/Twentieth Century Fox Home Entertainment, c2011. Soundtrack In English with optional English subtitles. Subtitled in English for the deaf and hard of hearing. Cary Grant, Ingrid Bergman, Claude Rains, Louis Calhern, Madame Konstantin, Reinhold Schunzel. Director of photography, Ted Tetzlaff ; music, Roy Webb ; editor, Theron Warth. Based on an original story by Alfred Hitchcock. Originally released as a motion picture in 1946. Special features: audio commentaries with film professors Rick Jewell and Drew Casper; The ultimate romance : the making of Notorious featurette; Alfred Hitchcock : the ultimate spymaster featurette; The American Film Institute award : the key to Hitchcock featurette; 1948 radio adaptation starring Joseph Cotten and Ingrid Bergman; Hitchcock audio interviews; restoration comparison; still galleries; isolated music and effects track; original theatrical trailer. Hitchcock, Alfred, 1899-1980 Film adaptations. Intelligence officers United States Drama.